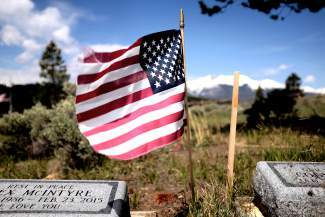 American flags dotted the Dillon Cemetery to mark Memorial Day on Monday, May 30. Beth Steele plays "Taps" at the Memorial Day ceremony at Dillon Cemetery on Monday, May 30. 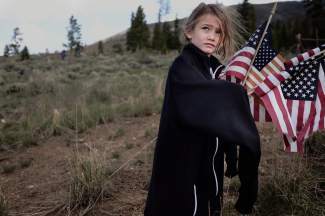 Five-year-old Danika Barth of Silverthorne helps plant American flags on the graves of U.S. military veterans at the Memorial Day ceremony at Dillon Cemetery on Monday, May 30. 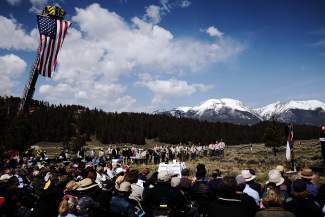 A large crowd of Summit County residents gathered at the Dillon Cemetery on Monday, May 30, to commemorate Memorial Day. Mary Jo Melvin places a flag on the grave of Sheldon Roush after the Memorial Day ceremony at Dillon Cemetery on Monday, May 30. 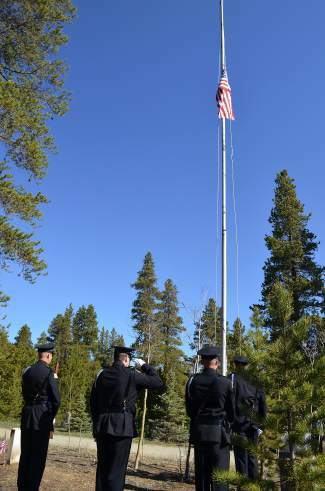 Members of the color guards for the Breckenridge Police Department and Red, White and Blue Fire raise a flag to half-staff during a Memorial Day commemoration event at Valley Brook Cemetery on Monday, May 30. 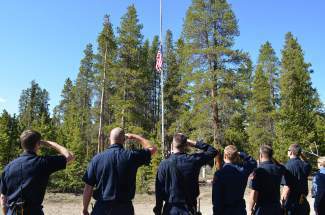 Local first responders salute the flag during a Memorial Day commemoration ceremony at Valley Brook Cemetery in Breckenridge on Monday, May 30. 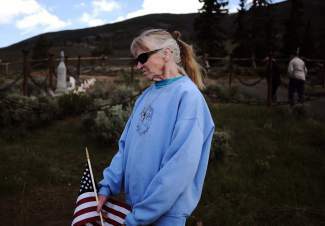 A Summit County resident pays her respects to a gravesite following a Memorial Day ceremony at Valley Brook Cemetery in Breckenridge on Monday, May 30. 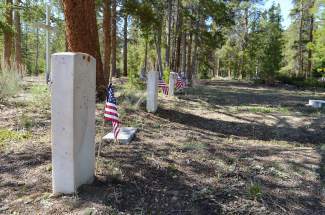 Breckenridge's Vally Brook Cemetery, which was recently listed in the National Register of Historic Places, is the site of a handful of military veteran headstones. Flags were placed alongside the markers on Monday, May 30, as part of events tied to the annual morning Memorial Day ceremony held there. 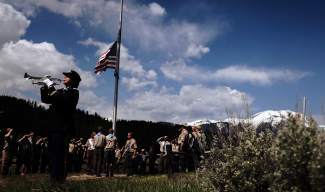 Summit County joined the rest of the nation on Monday, May 30 in saluting those who have lost their lives serving and protecting the country, presenting the once-a-year Memorial Day ceremonies at the burial grounds of both Dillon and Breckenridge. A sun-splashed morning met about 150 attendees at the Breckenridge Heritage Alliance’s fourth-annual observance of the holiday at the Valley Brook Cemetery off Airport Road. The event kicked off with Breckenridge Town Councilwoman Wendy Wolfe welcoming guests and giving thanks to those who came to pay their respects. The four-year American Civil War, still the deadliest war in U.S. history, concluded in May 1865. Informal spring commemorations around the country’s newly-built national cemeteries started not long after, and, in 1868, the precursor to the yearly tradition — Decoration Day — was established for May 30. The annual ritual evolved into Memorial Day after additional wars made it so it no longer became solely about remembering those who died during the Civil War. 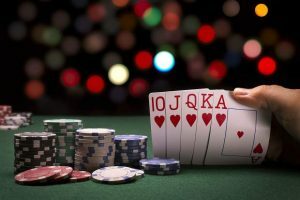 U.S. Congress later passed the Uniform Monday Holiday Act in 1968, formally identifying Memorial Day as the last Monday in May, which took effect in 1971. 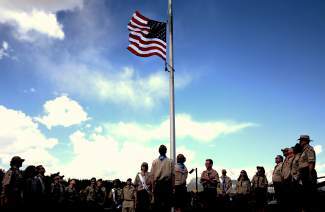 After the raising of the flag to half-staff — per custom between sunrise and noon on the holiday — by the color guards of the Breckenridge Police Department and Red White and Blue Fire, as well as the singing of the national anthem, Simpson made one request of the crowd. 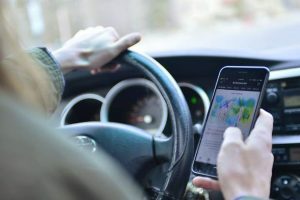 The Breckenridge resident of 27 years upon retirement from the armed forces after three decades of service, asked that in their thoughts they also include a conflict that is often overlooked: the Cold War. Both Christian and Jewish community leaders offered prayers and Maj. Kerry Davis, a 30-year vet of the Army still serving in the Colorado Army National Guard, who made the trip up from Buckley Air Force Base in Aurora, gave a keynote address. The day pays respect to the fallen by remembering their names, but not by the day of their sacrifice. Rather, it’s about their willingness to serve and put themselves in harm’s way, and Davis encouraged toasts to these courageous individuals as a tribute to them and their families. 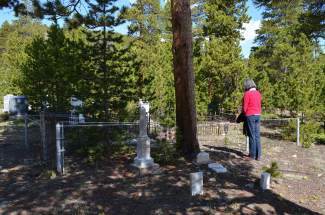 Wolfe and Davis then laid a memorial wreath by the flagpole near the handful of veteran gravestones, but not before Breckenridge resident Bonnie Smith led the audience in the singing of “America the Beautiful.” She noted in advance that a brief stay in Colorado inspired some of the lyrics written by Katharine Lee Bates before Samuel Ward later came along and put the poem to tune. But Monday’s rendition proved well suited for the outdoor setting by locals, with more than a few taking out cellphones to record the collaborative patriotic psalm.